Harmonium Brass, formed in 2009, has earned the reputation as one of Missouri’s top performing ensembles. The group is comfortable playing anything from early Renaissance music to contemporary compositions and everything in between [big band, patriotic, seasonal, marches, and show tunes]. The group has performed concerts for arts associations in Moberly, Kirksville, and Trenton, and has performed with the Marshall Philharmonic Orchestra and the Marshall Municipal Band. Convention/conference performances have included the Missouri Bandmasters Association, Missouri Women in Agriculture Conference, the Missouri Chapter of the Phi Beta Mu International Band Directors Fraternity, and the Missouri Music Educators Association. Harmonium Brass has also played several concerts, weddings, parties, and other events throughout Missouri. Each of the group’s members has extensive music education experience. The group has presented clinic/performances for the Missouri Bandmasters Association [Successful Small Ensemble Literature for Brass Quintet], and the Missouri Music Educators Association [Chamber Music: Gateway to Valuable Musical Experiences]. Additionally, each of the members has also presented clinics on his/her instrument, and other areas of instrumental music. Harmonium Brass was honored to be selected to serve as the demonstration group for retired Canadian Brass trombonist Eugene Watts clinic at the Missouri Music Educators Association Worskhop/Conference in January, 2013. The group performed several selections to augment Mr. Watts’ presentation. 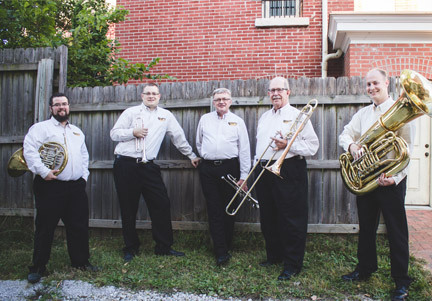 Harmonium Brass is listed by the Missouri Arts Council on the Missouri Touring Performers Directory. © 2013 Harmonium Brass. All rights reserved.